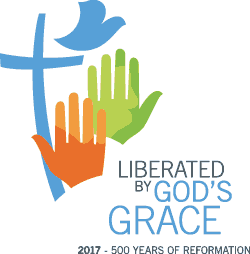 (LWI) – The Vatican has issued a postage stamp to commemorate the 500th anniversary of the Reformation. The series which goes into circulation today, 23 November, depicts the crucified Christ in the foreground. Kneeling at the foot of the cross are Martin Luther and Philip Melanchthon, holding the Bible and the Augsburg Confession respectively. The background shows a timeless view of the city of Wittenberg, where Luther nailed his 95 Theses to the door of the castle church in 1517, launching the Protestant Reformation. The Vatican will issue 120,000 of the Reformation stamps.